The definition of effective softfall is “an impact absorbing medium that slows the falling child down over the greatest possible distance”. Rubber surfacing is strong, durable and incredibly versatile. Generally speaking, rubber is ideal where traffic flow is constant. It is not just for humans either, you'll find our products are also ideal for a number of animal applications. Combined with its anti-slip surface and shock absorbing properties, our surfacing solutions are an attractive and safe surfacing alternative for projects large or small. Our product of choice is manufactured in the UK, by Rosehill Polymers and brought to Australia & New Zealand by Surface Designs. Rosehill TPV® is the only one of its kind in rubber wetpour. Made from premium quality virgin polymers, combined with the highest possible UV stabilized pigments so as to retain its colour, even in our harsh Australian climate. Rosehill TPV® rubberised Softfall has many benefits such as it is QUV Weatherometre tested, it doesn’t leach out black carbon or colour pigments, will not fade even with our harsh weather conditions, is non-porous, long wearing, non-toxic, non-allergenic, doesn’t contain any heavy metals, it is very vibrant, has good colour consistency, and complies to Australian standard ASNZ 4422:2017 as well as global standards BS EN 1177 and BS 7188. 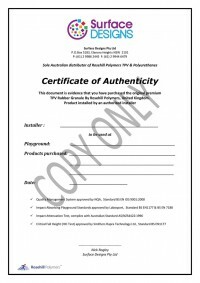 To access more information regarding Rosehill TPV® rubberised Softfall please click on the logo below. Our independently certified Softfall sand has been sourced and supplied by a local civil construction company, working together we have achieved to be able to supply a high quality softfall product for our customers, with certification exceeding Australian Standards. Sand has a high social factor – Children (and parents) love playing with toys and digging in the sand, making sand castles etc. Compared to other surfaces sand tends to stay cooler in the hot months and sand has an initial low cost, is easy to install, readily available and spreads easily.